Note: Gunboat; auxiliary Barkentine rig. Sections prefabricated by Stackhouse & Tomlinson in Pittsburgh, PA & assembled in Erie, PA.
36 x 39", 18.3rpm direct acting engines, Samuel Stackhouse. 10 x 19' @ 15.5# steam low pressure boilers. 22' diameter simple radial wheels. 1950 Bow & cutwater erected as monument near shipyard where she was built. Built for defense of the Lakes after the Canadian Rebellion of 1837-40 because of armed British ships on the Lakes. 1844, Sep 29 Commissioned; armed with two 68" Paixhans cannons & four 32# carronades, but because of the Rush-Bagot British-American disarmament treaty, was reduced to single 18 pounder. 1851, May Assisted in the arrest of James J. Strang, "king" of the Kingdom of God on Earth Mormon Colony, established on Beaver Island, MI, Lake Michigan. 1853, Apr Changed to schooner rig. 1853, May 9 Collision with propeller BUFFALO off Pointe Aux Barques, MI, Lake Huron. 1853, Aug Repaired, Chicago, IL. 1853, Oct 6 Ashore 12 miles east of Michigan City, IN, Lake Michigan. 1861 Patrolled Lakes Erie, Huron & Michigan during first part of the Civil War; Armament increased with 10, 20 & 30# Parrotts; 12, 24# howitzers; one 64# bow gun; 1 stern gun. 1862, Sep Aground St. Helena Reef, Lake Michigan. 1863 - 64 Guarded Johnson's Island near Sandusky, OH where Confederate prisoners were kept. 1868 Took active part in repressing Fenian invasion of Canada. 1873, Jul Ashore at Light House Point; pulled off, uninjured, by propeller BROOKLYN. 1887, Apr Received new Gatling gun, long pattern. 1887, Aug Only American vessel on the Great Lakes designated by Secretary of the Navy to enlist apprentice boys for the Navy. 1892 - 93 Reconditioned; 2 new scotch boilers. 1895 Aground Pelee Island, ONT. 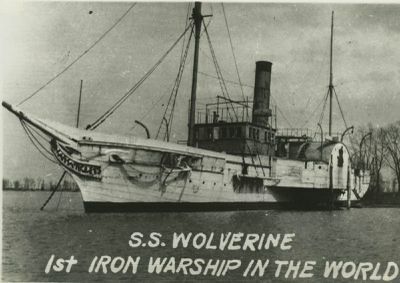 1905, Jun 21 Renamed WOLVERINE. 1912, May 6 Decommissioned & turned over to Pennsylvania Naval Militia for reserve training. 1923, Aug 12 Port-side connecting rod fractured on Lake Huron; returned to Erie; Navy vetoed repairs; beached Misery Bay, Erie, PA.